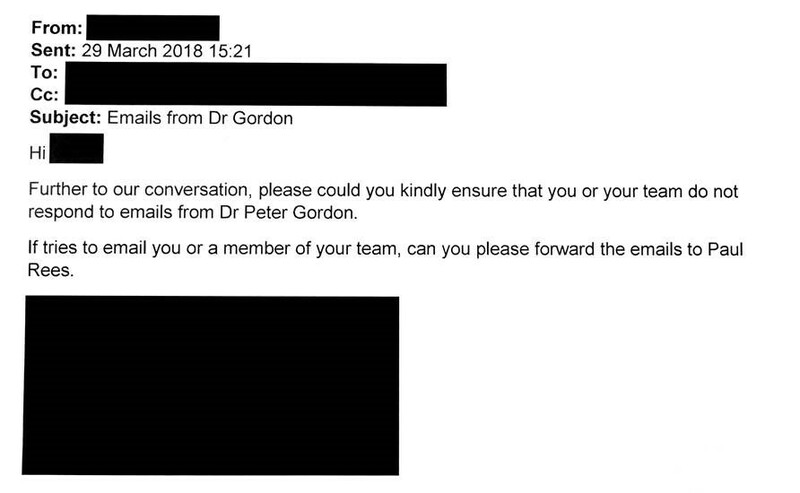 A month before I resigned from the Royal College of Psychiatrists I made a Subject Access Request asking for College communications that involved me to be released. At the beginning of this month I recieved a large bundle of printed material from the College that exceeded 300 sides of A4. Of this material supplied by the College 93 A4 sides had been COMPLETELY redacted and another 94 sides had everything redacted other than a subject heading, date, and/or partial address list [in other words NO content was provided]. Of the remaining material 32 A4 sides were full copies of my communications over the years with the College in relation to ethics, transparency of competing interests, and realistic medicine. 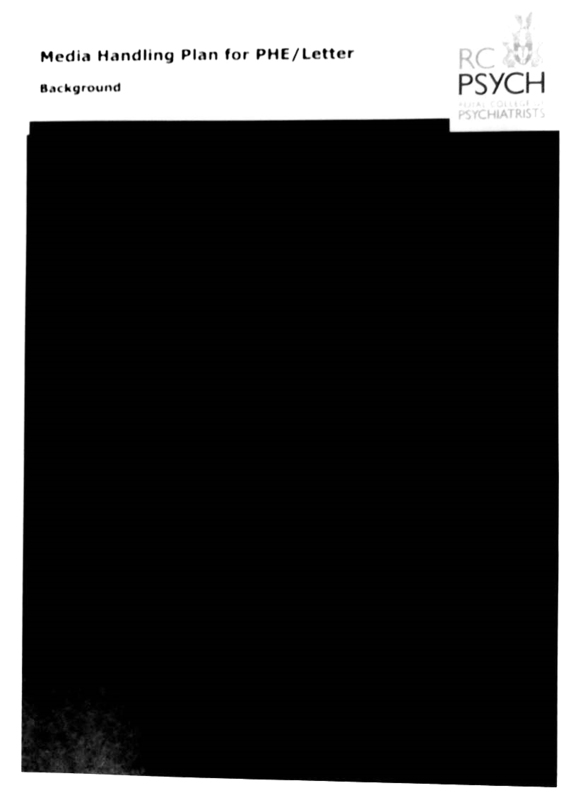 I have shared the Subject Access response on my blog as it gives a most hampered glimpse [through a deep dark sea of redactions] of approaches taken by organisations, such as the Royal College of Psychiatrists, to vital matters such as ethics, philosophy, transparency and candour. In general terms, inquiry after inquiry have concluded that without the open and welcome consideration of such matters, learning will be hampered, and patient harm may result. My intention now is to write to the Information Commissioner expressing my very real concerns about the organisational culture of the Royal College of Psychiatrists. what a very disappointing exercise this must have been for you, and also quite disheartening that the RCP does not have the courage to reveal their true thoughts. It makes me wonder what the point of sending some of those documents was, other than to be intimidatory in a literally veiled manner. Very odd. 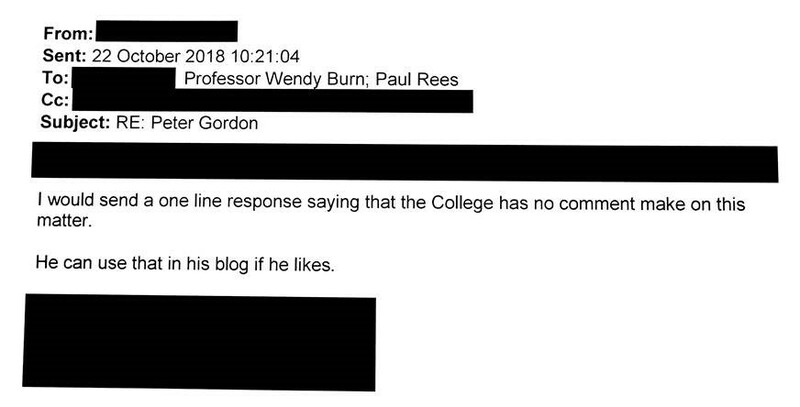 Yes, it was a disappointing response, given that the Royal College of Psychiatrists had determined that it was “necessary” to redact the vast majority of material in which I was included in the subject matter. It is also particularly ironic given that I have been campaigning for many years for more openness in science! I am not that familiar with the law here on subject access (through FOI) so if anybody can offer me guidance I would very much welcome this. I will definitely be writing to the Information Commissioner. Thanks again Ed for sharing your thoughts. This is appreciated. 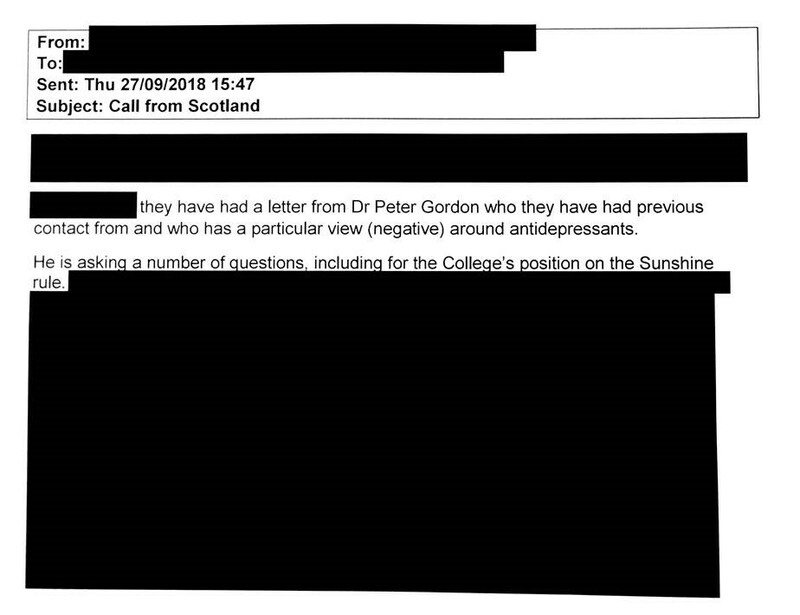 Dr Peter Gordon’s saga with the Royal College of Psychiatry UK is shocking. His treatment at the hands of these ghouls is disgraceful. 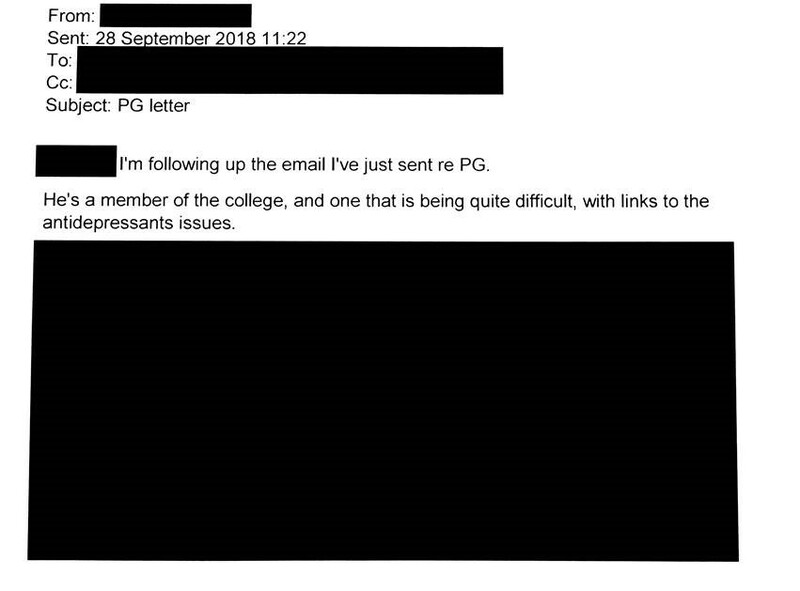 These emails from the Royal College display their complete and utter contempt for those who dare to challenger their lucrative (Pharma-funded) Power paradigm in the mental health arena. Peter is a light in the darkness. The Royal College of psychiatry should be deeply ashamed of themselves and I think there should be a public inquiry into their dealings over the past 20 years. All I can say is, thank you. Christine Standing. Shocking and staggering in equal measure. 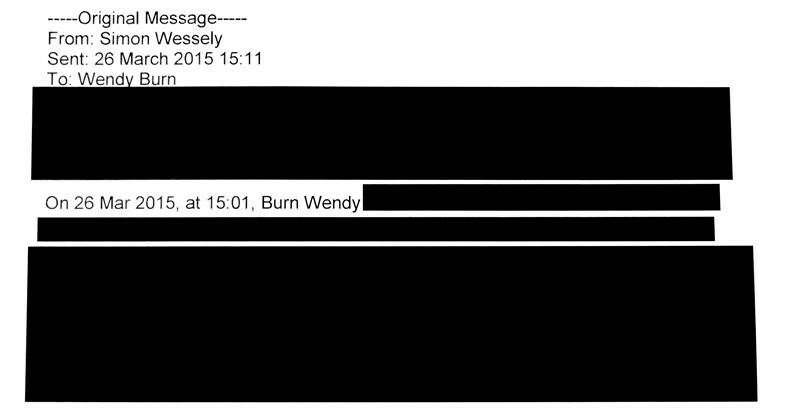 If the Royal College has nothing to hide it must remove the redactions, however I believe the Royal College has a lot to hide hence the massive censorship. There should be a public inquiry into the Royal College, it seems conflicts of interest abounds, and corruption is rampant..